When I first started beading back in 2001 some of the first things I made were my geometric beaded beads which started my love affair with geometric beadwork. Ever since then I have frequently returned to the same shapes and idea and perfected them. 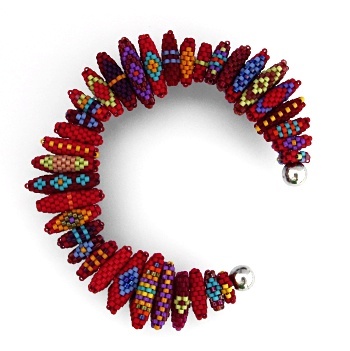 This set of 35 beaded beads is the latest in the series and can be worn as a set threaded onto a bangle or worn separately in a number of other ways. The instructions for these triangles can be purchased here.